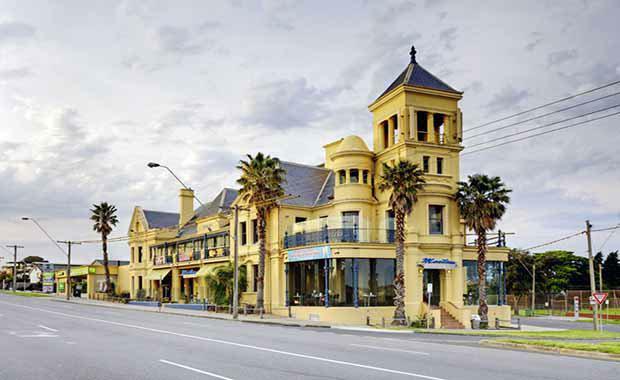 Mentone Hotel in South East Melbourne has been listed for sale with CBRE Hotels. The hotel, located at 95 Beach Road, is a prominent landmark with an 1880’s heritage. For the past eight years, Open Door Pub Group has operated the business, but the arrangement will conclude on November 17. Once the arrangement ends, the hotel will close and CBRE Hotels’ Scott Callow and Joseph Du Rieu and CBRE city Sales agent Mark Wizel have been appointed to sell the property. The Hotel features a bar, restaurant, outdoor courtyard with bar and a first floor function room. The external architecture of the hotel has been retained, along with many of the internal features including the main staircase. General Manager of Property for Leawarra Falls Pty Ltd Matthew Hogg says he welcomes calls to list the hotel on the Victorian Heritage Register. “The historic building will and should be preserved as part of any hotel refurbishment or future development,” Mr Hogg said. Mr Callow says they are expecting a large amount of interest from both hotel operators and developers due to the hotel investment market being strong over the past years. Mr Wizel agrees, adding that due to the location, it adds a bonus to buyers. “Hotels on prime sites continue to provide outstanding investments. “Given the closure of the Mentone Hotel it is expected that the property will have strong interest driven from developers and hotel operators seeking to capitalise on the large site and the prime location,” Mr Wizel said. The Mentone Hotel is being offered to the public through expressions of interest campaigns due to close in early December.